Plan your trip beforehand by picking a starting and ending point along with a few stops in between. They don't have be close but they should be on or near a bus route or L line. Enjoy! Experience a 'hood you wouldn't normally venture to, while sampling the beer that's helping to make this city so flippin' special. The CTA's Damen Avenue bus is like an express ride to some of Chicago's finest drinking establishments. Damen and it's surrounding blocks've got it all, with quiet tree-lined residential streets harboring dozens of gems tucked just off its corners. It also happens to have its north terminus at Ashland & Foster in beautiful Uptown, which coincidentally is less than a two minute walk from Michael & Louise's Hopleaf (5148 N Clark St.). Most readers are likely already familiar with Hopleaf, but if you've somehow yet to make it to one of Chicago's most deservedly famous beer establishments, you should get on that as soon as possible. And here's a great chance to do so. Long recognized as one of the world's best bars, Hopleaf boasts a drink menu of 350+ beers with no shortage of them on tap. While they lean towards Belgian brews, any beer lover will have no issue finding something they like on their expansive menu. Their food is also sensational and their knowledgeable staff aren't afraid to take a few minutes to share recommendations. Start out at Chicago's favourite gastropub, Hopleaf, at Clark & Foster. We started our CCC #1 on Hopleaf's lovely back patio (a relatively new expansion and one that rectifies the only complaint people had about the original Hopleaf, it's once small size). A large cabana provides shade for the fifteen or so small tables scattered throughout and creates a quiet ambiance for people enjoying their brews. We sampled a number of their rarer offerings, fittingly outside next to a giant hop vine growing up the brick wall. This is place that you can easily spend an entire afternoon, but we had work to do. So, reluctantly we dragged ourselves around the corner to the nearest Damen bus stop, heading south. Post-Hopleaf, hop over to the #50 bus and head over to the rooftop at Fountainhead. Skip the bus and walk a couple blocks southwest to the ever-popular Half Acre Tap Room. A 5-minute walk separates Fountainhead and Half Acre, arguably Chicago's finest and fastest growing brewery. Heading just one block south on Damen then 2 blocks east on Cullom Avenue gets you over to Lincoln Avenue and the front door of The Half Acre Tap Room (4257 N Lincoln Ave.). After just 4 years of full-time production, Half Acre has already taken the city's craft beer scene by storm and is considered a favourite by beer lovers across Chicago, including us. Their tap room is a small, nondescript dwelling attached to the side of their brewery. Encouraging you to BYOF (Bring Your Own Food), Half Acre is a great place to stop in to sample one of their distributed staples or explore one of their more experimental brews only available on-site. The small shop feel, beautiful space and ever-changing offering make it a worthwhile stop, even if you're just passing through. If you don't have time to sit down, stop into the shop next door for a growler refill and chat with the ever-friendly staff who are more than willing to let you sample what's on tap before making your final 64 oz. choice. South on the #50 to Roscoe St. will land you another block or so from the Village's hidden gem, on Hoyne. Half Acre is another place you can spend a whole afternoon, but we had two more stops on our crawl. So, we headed back down two blocks to Damen and hopped back on the southbound #50. In less than 10 minutes, the bus got us to Roscoe Village and beer-aficionado-favourite, Village Tap (2055 W Roscoe St.). A bar we've frequented many a time, Village Tap isn't a place where you'll find a hundred taps just there to fill out a menu. Instead, they constantly rotate an incredibly impressive list of brews that you've likely never heard of. If you want something new each time you visit, from a brewery you've never tasted, this is the place to go. This, combined with their always bustling beer garden, makes for a special place to spend a sunny Sunday afternoon. If you're still with us at this point, you're likely nearing the end of your tether and about ready to call it quits for the day. There is, however, one stop left on our tour. And the finish line is a watering hole not to be skipped. If you live in Chicago and appreciate a good beer, you've been to The Map Room (1949 N Hoyne Ave.). 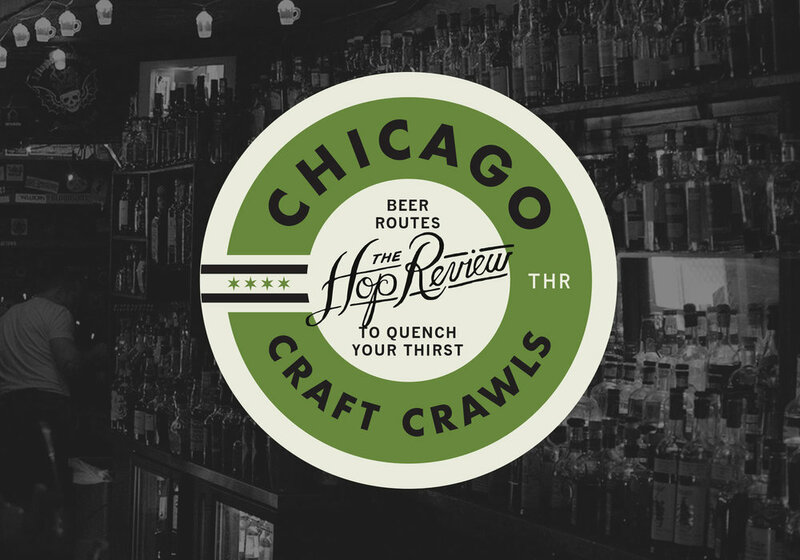 It's one of the city's original beer-centric bars and the perfect anchor for our inaugural Chicago Craft Crawl. Further away than the rest of our pit stops, The Map Room is worth the fifteen-or-so-minute bus ride. Located just off of Damen on Armitage Avenue, it offered a perfect way to wind down after a long afternoon of sun and beer. Finally, end the day by racking your brain over making a final selection from the hundreds of options at the Map Room. And with that, we reached the conclusion of our first Chicago Craft Crawl. Public transportation is often viewed as a necessary evil in big cities. On days like this though, we like to think of it as an efficient and cheap channel to explore this great city. From Hopleaf to The Map Room, the #50 Damen bus took us quickly and efficiently through some of the North Side's most beautiful neighbourhoods and finest drinking establishments. Next time you've got an afternoon to burn: grab a couple friends, hop the bus or L, and get out to explore Chicago's booming beer culture. Attention fellow Chicagoan beer enthusiasts: this was our first Chicago Craft Crawl and we'd like to do it again! Have any suggestions of places we missed on this trip? Know of another route through the city using public trans that will get us to some great beer? Let us know!